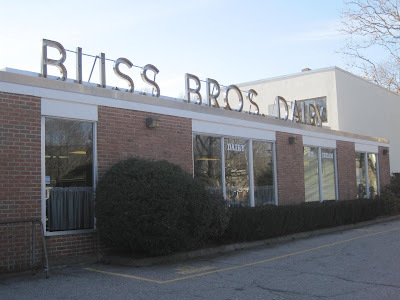 One of my most delicious memories from growing up in New England is Bliss Brothers Dairy in Attleboro (Massachusetts). We'd go there for post-church lunches, weekend dinners, and best of all, ice cream! My very own mother once worked behind the counter, scooping up delicious dishes of fabulous Bliss in ice cream form. Bliss Brothers started out as a dairy, but they are now full-service, offering breakfast, lunch and dinner, and of course, their awesome ice cream. 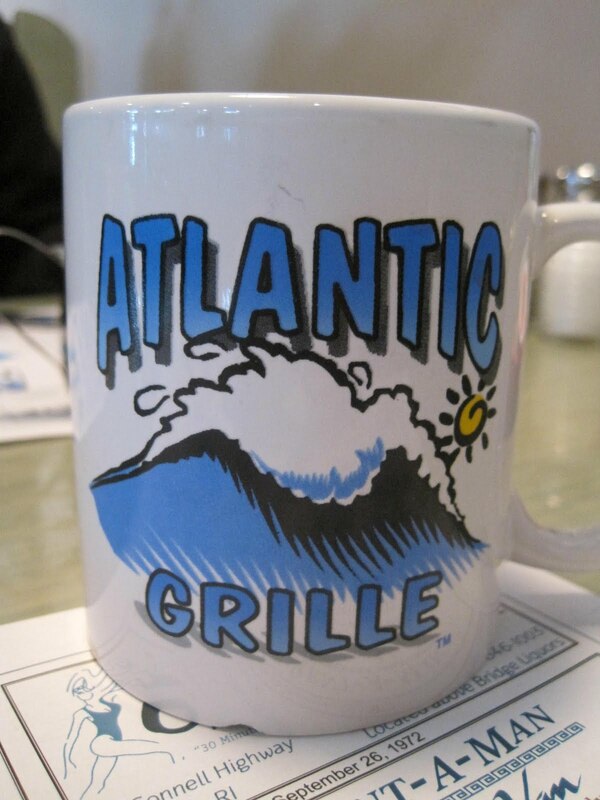 We'd had an early brunch there with a friend, but after taking ABF around Attleboro to see the sights, my old stomping grounds, schools, homes, and more, I told him we had to stop for something sweet. 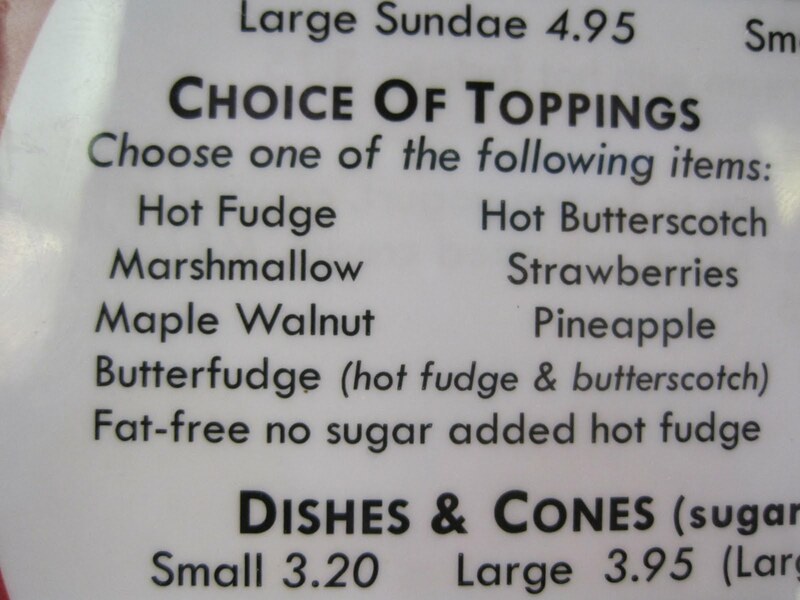 In other words, I wasn't leaving town with some Butterfudge in my belly. You heard me. Butter. FUDGE. 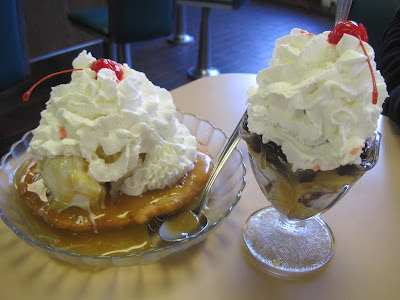 Bliss Brothers earned my undying devotion so many years ago by putting together rich, decadent hot fudge with butterscotch--you don't choose one or the other--you get them both!! Huzzah! 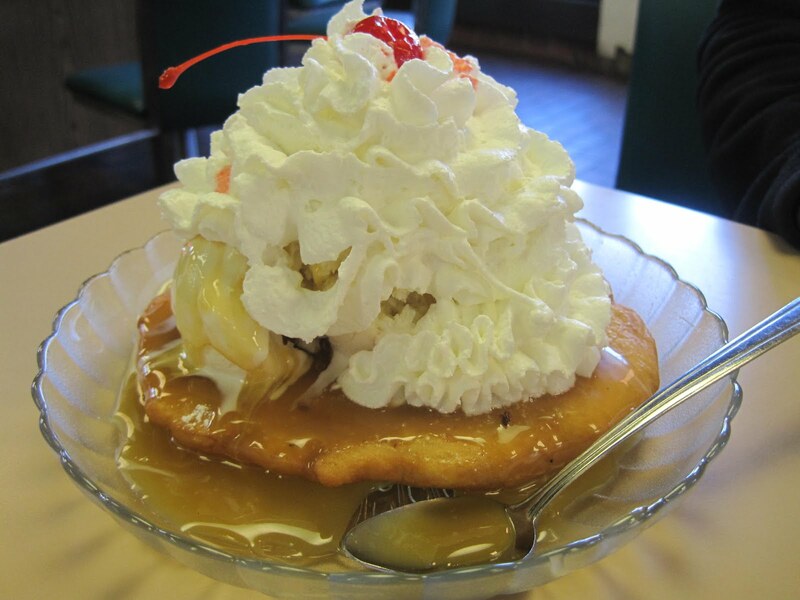 ABF saw the fried dough sundae and was immediately on board with that. I'll admit, I did not buy into it at first---fried dough? Like the funnel cake I just don't get?? But once again, ABF proved his ordering expertise, because this was AMAZING. If Butterfudge didn't exist (and let's not imagine that scenario for too long), this sundae would be a handy, delicious, oh-so-bad-for-your-hips-but-lovely-on-the-lips replacement. His only suggestion would be that they serve it in smaller pieces--the dough is a bit unwieldy to cut and requires at least a decent knife to go with it--but he'd order it again without question! On our way out, we stopped in the store section to see what people can take home now. Along with the tubs of ice cream I remember so well, we also saw other dairy products and an ice cream pizza. If we were staying in Attleboro, I have a sneaking suspicious ABF would have walked out with one of those! I grew up in Attleboro, Massachusetts before we packed up and moved west, and a favorite dining destination was, and always will be, Bliss Brothers Dairy. YUM. Just YUM. I drove ABF up there during our RI stay so we could have brunch with a dear family friend. We met Sunday morning and as soon as I stepped indoors, I went back about 20 years in my emotional time machine. Not much has changed about the interior--and I mean that in a good way. 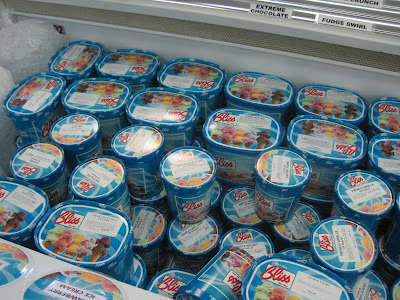 The ice cream tubs are still there, booths look the same, but it's all well maintained. Nothing old and musty about this bustling spot! 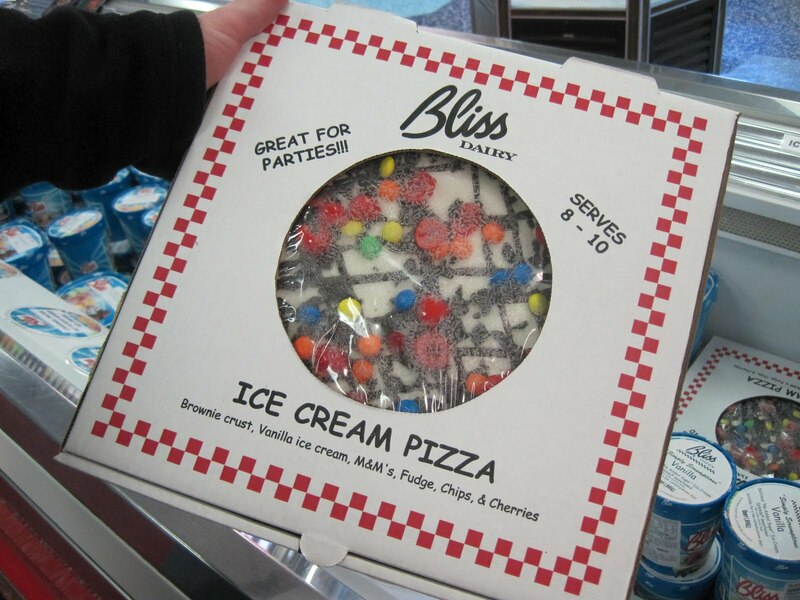 I was primed for THE thing to order: The Bliss Special. This is a delicious, juicy burger with onions, lettuce, tomato, bacon, and a slice of Vermont Cheddar Cheese. Also? Crispy, crinkly fries, which set the bar for all future fries in my life. I hesitated at first, hoping it would taste as good as I remember it. YES IT DOES. Another must-try at Bliss is their raspberry-lime rickey, which also set the standard incredibly high for all rickies (rickeys?) to come. So good. 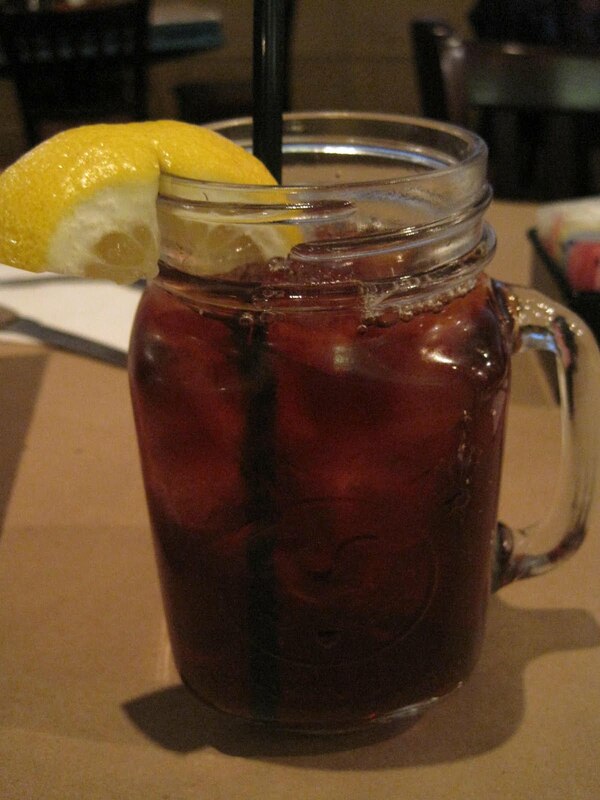 I get mine with club soda instead of lemon-lime soda--cuts the sweetness so it's juuuuust right. Oh, it's liquid SUMMER, I tell you! 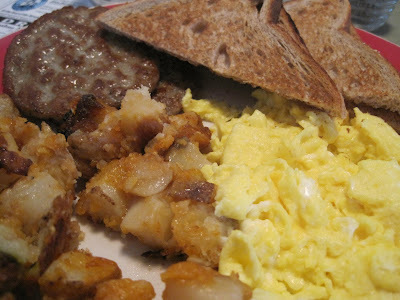 ABF was in the mood for breakfast, so he went with the 2 eggs, sausage and toast special with a side of baked beans. I don't know if I've ever had the beans before but they were SO good--a serious dose of pepper that made them more savory than sweet! 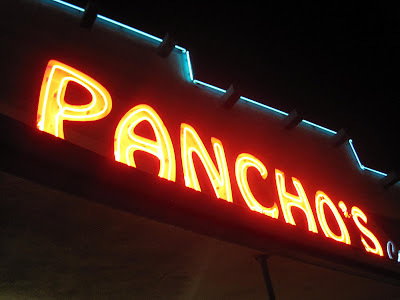 We had a great visit over some excellent food, super service, and in some ways, it was as if all those years never passed. Some things ARE still as delicious as you remember! 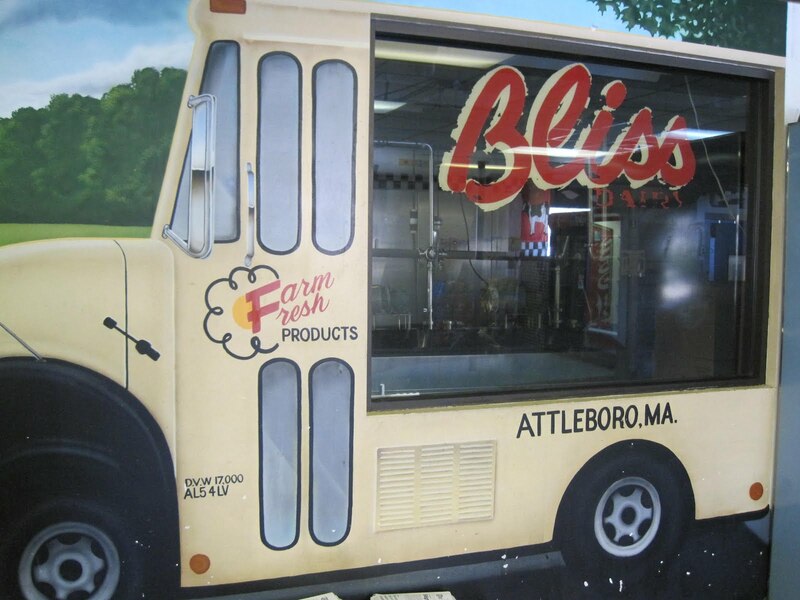 The best part about Bliss, though, is their homemade ice cream--read about that visit here! While walking through Newport's picturesque waterfront, ABF & I popped into The Cookie Jar to grab some sweet treats. It was almost impossible to resist the smells of freshly-baked cookies that lured us inside. The Cookie Jar also offers coffee and hot chocolate, but we were on a food-only mission. We picked up an M & M cookie (sugar cookie dotted with M & M candies, a fave of ABF's), a peanut butter, and a Snickerdoodle (one of my faves). The peanut butter was wicked rich--I wish I'd had a glass of ice-cold milk to go with it. Just a few bites was all I could manage. That's not a bad thing at all--this is just a very intense cookie--if you can eat two of these, consider me impressed! I had plenty of room, however, for the Snickerdoodle, which had a salty kick behind the cinnamon-sugar coating. Delish! The favorite for us both, however, was the M & M cookie. We actually took a few more for the road, and they did not live long! If you're in Newport, pop in here for cookies so delicious you'll swear my mom (or maybe even yours) gave them her recipes! ABF & I took a quick trip this weekend up to the Newport, RI area. We stayed in Middletown (just 5 minutes outside Newport), where we found crazy cheap hotels and crazy cheap food. What could be better? Our hotel was across the street from the Atlantic Grille restaurant, and we popped in there for breakfast one day. 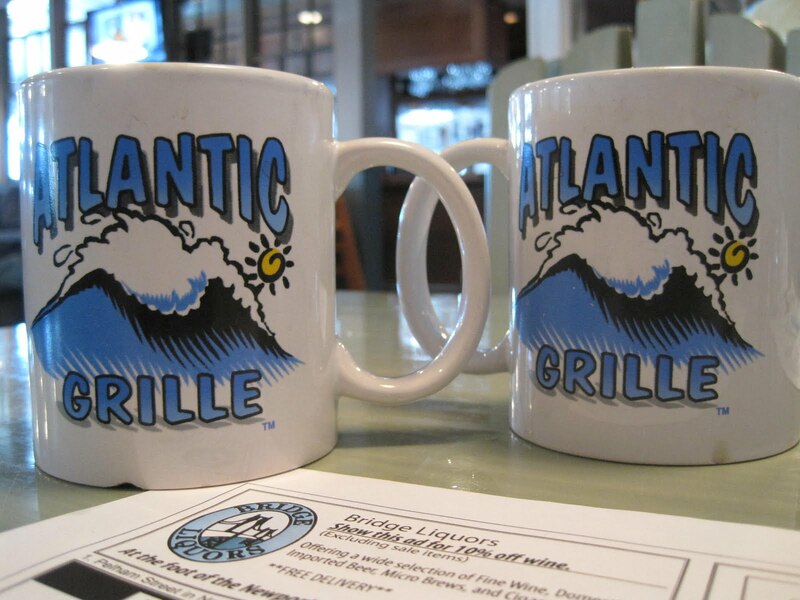 They serve breakfast until 3pm, which made ABF quite happy. We sat in the area that is comprised of Adirondack chair-type benches and tables. Interesting! I found this more comfortable than he did (do I need to explain that I have a bit more booty-padding than he does? 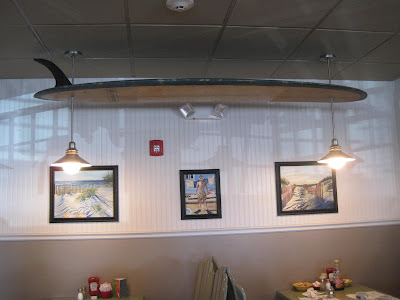 ), and we both liked the surfboard-turned-lighting equipment that was over our heads. 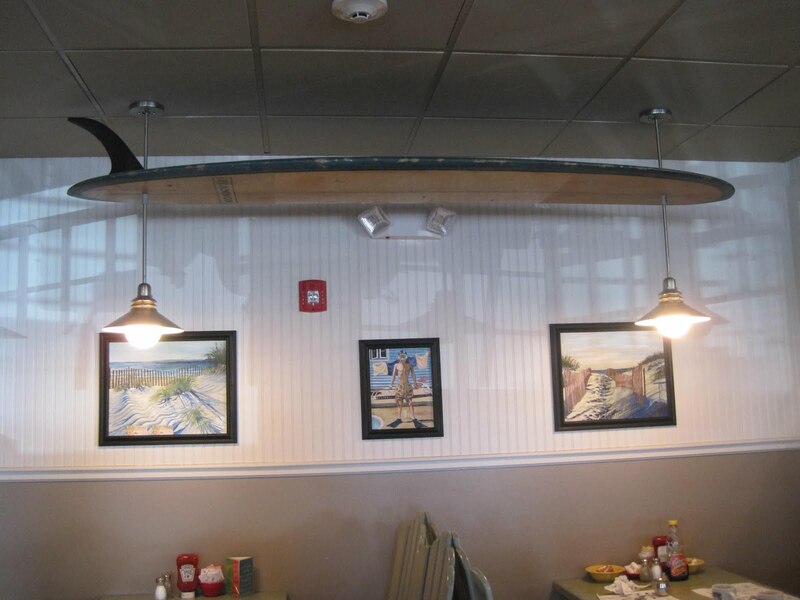 The restaurant has a fun, clean, beachy feeling. 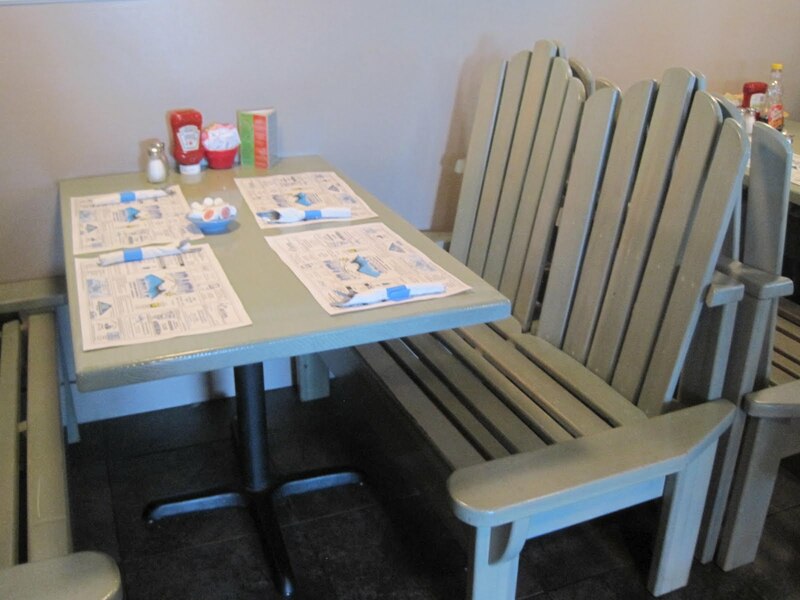 I ordered the First Beach breakfast, which comes with one egg, one pancake, home fries, and toast. I opted to have a banana pancake (.50 cents extra, worth it), as I'd heard good things about them. I also got marble rye toast and an over-easy egg. Everything was delicious! Next time, however, I'll skip the maple syrup (Mrs. Butterworth's--no thank you!). 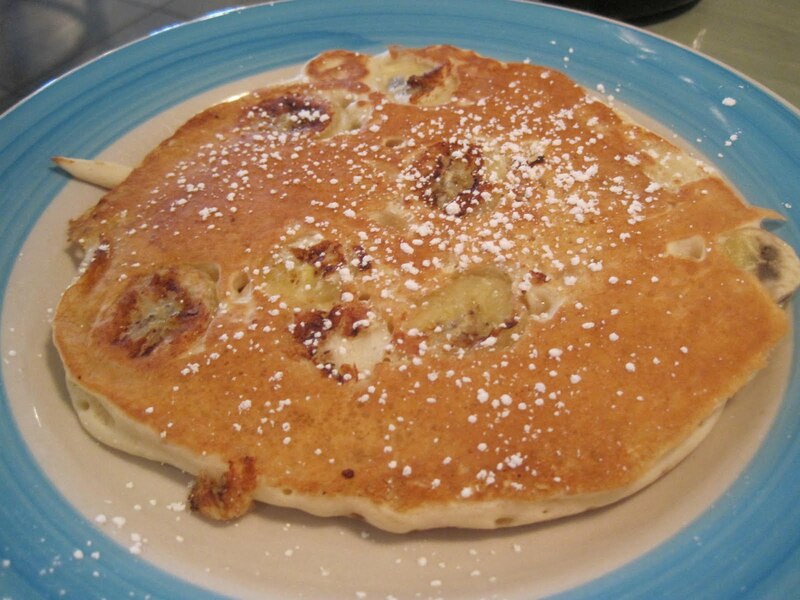 The super-ripe pancakes are all the sweetness this pancake really needs. 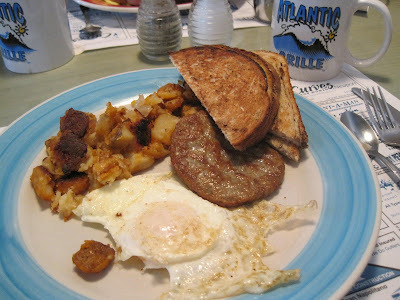 ABF ordered the Second Beach, which is 2 eggs, 2 pancakes, and the homefries & toast. He opted for whole wheat toast instead, and regular pancakes. I had a bite or two of his regular pancakes (and shared some banana with him) and they were good--fluffy but with a nice chewiness. We both agree the homefries are AWESOME! Soft, crunchy, and a nice heat to them. Normally I pick at these, but I ate up every bite. 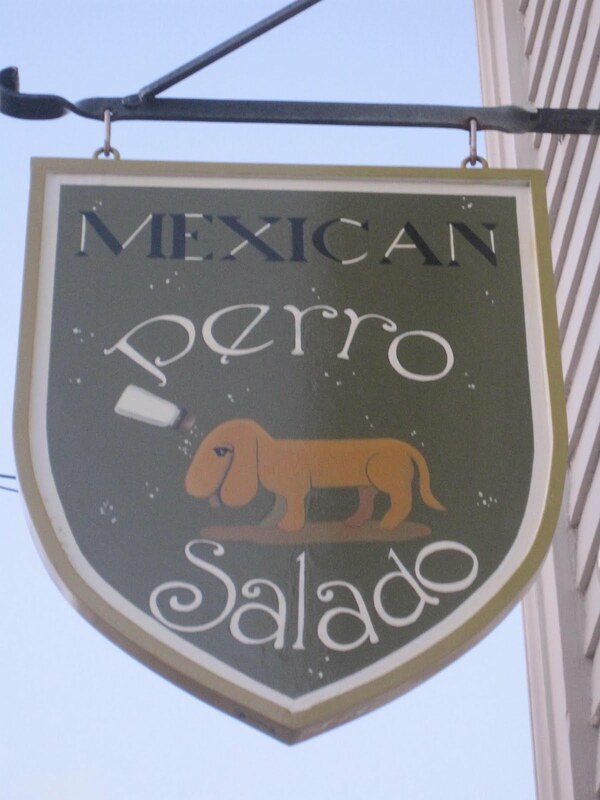 Our meal came quickly, everything was fresh and delicious, and the service was fantastic. 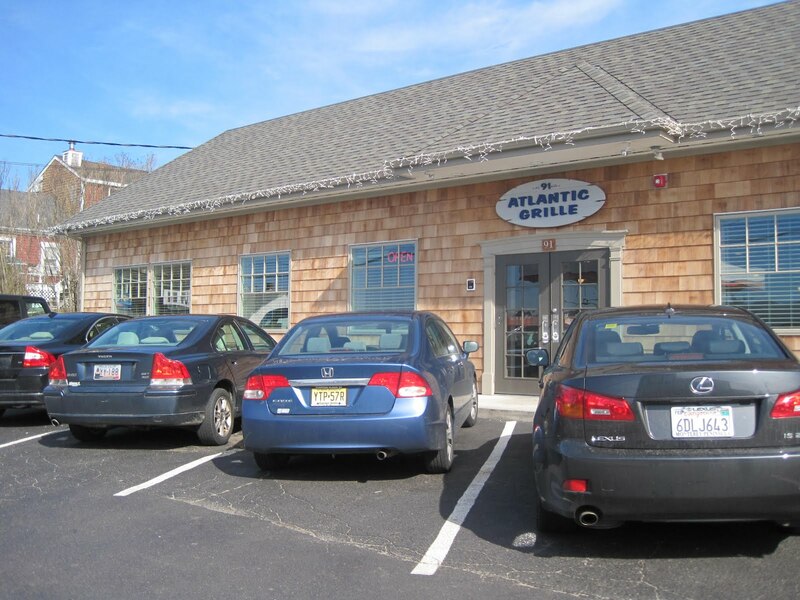 We will definitely be coming back to Newport, and we'll definitely be eating at Atlantic Grille again! ABF & I took a long weekend up to Rhode Island (one of the many states I once called home) and stayed just outside Newport. This was ABF's first trip there, so I was excited to show him around the area. 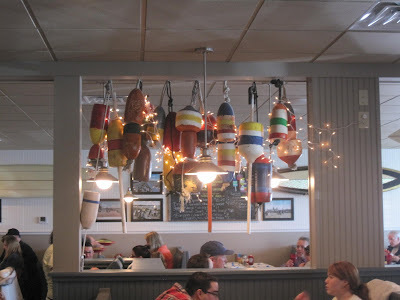 One of our first meals was at the Red Parrot, just a quick walk from the waterfront. They filed us over to the bar and said it would take about 20 minutes to be seated, but it was more like 5. We went up to a large room on the third story and saw that there were actually quite a lot of open tables, so don't worry too much if it seems crowded at first (unless it's the middle of the summer and then I have a feeling there is always a wait). We always get some New England clam chowder whilst in New England--I wasn't hungry enough for my own, but ABF was kind enough to share several bites with me. It was creamy, good bits of clam, and even better with a sprinkle of black pepper. Red Parrot has a huuuuuge menu. It took us a while to figure out what we wanted to eat, but I finally settled on the Jerk chicken salad (which also came with jerk shrimp--bonus!). This was not anywhere near as spicy as I expected, but it did have a lot of interesting flavors. Perhaps a little too heavy on the spices for me--tasted a bit too woody, but I brushed off the excess and devoured as much as I could. The ranch sauce on the side? INSANELY delicious--and I don't even LIKE ranch! 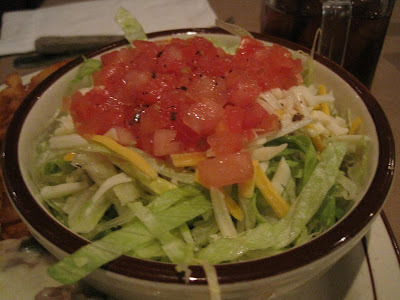 The veggies were insanely crisp--I wish I had another one of these salads right now! ABF ordered the Popeye sandwich, which was a grilled chicken breast with a hefty helping of sautéed spinach. It came with sweet potato fries which were so fabulous that I think I can officially declare them the best, lightest, most scrumptious SP fries ever. The sweet potato flavor was so strong and present--it didn't taste like just 'fried' stuff. 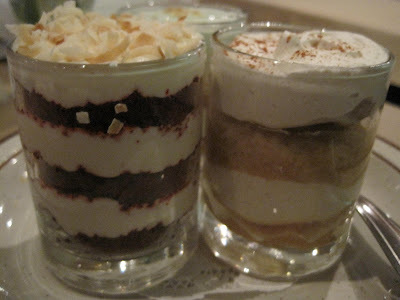 Our food was delicious and we had a great spot right by a window overlooking Thames Street. The only oddity of the meal was that they never took away my big messy plate of unfinished salad--not even when they brought ABF his postprandial coffee. It was very clearly a 'done' plate, with my silverware and napkin on top, but several people just walked past. I thought it might disappear while going off to the restroom, but no such luck. Weird! And kind of unappealing. The servers who came by were in and out so fast we didn't even get to ask them to take it. Long story short, follow-up service was a bit slow and it took a while to get our check, but we were in no hurry so it wasn't a dealbreaker. Red Parrot is located at a prime tourist spot if you're checking out Newport. It's not cheap, but moderate/reasonable ($14-15 average entree) and delicious! Anyone who knows me knows I love some good Tex-Mex (and the requisite 'rita). 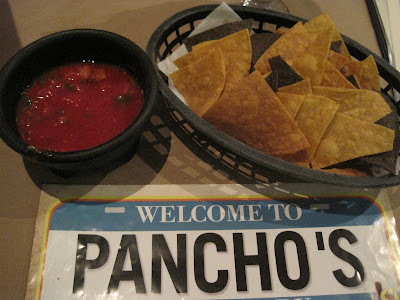 ABF & I stopped at a Long Island institution this weekend: Pancho's in Island Park. 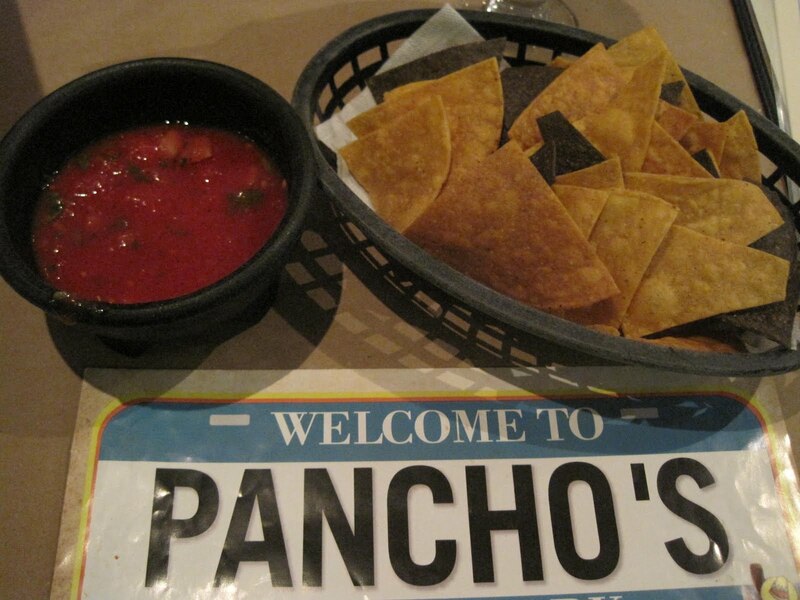 Our server was very easy-going and friendly, without being too bubbly. She asked if she could make a margarita recommendation, and I said fire away! 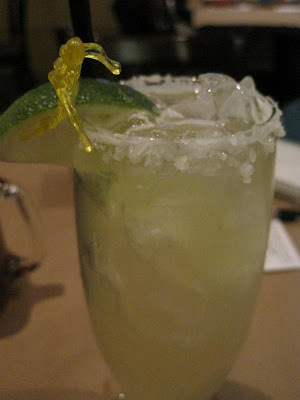 She suggested I try the Sauza-rita, which consisted of Sauza Tres Generaciones tequila and Cointreau. On the rocks with salt, of course, and it was delicious! 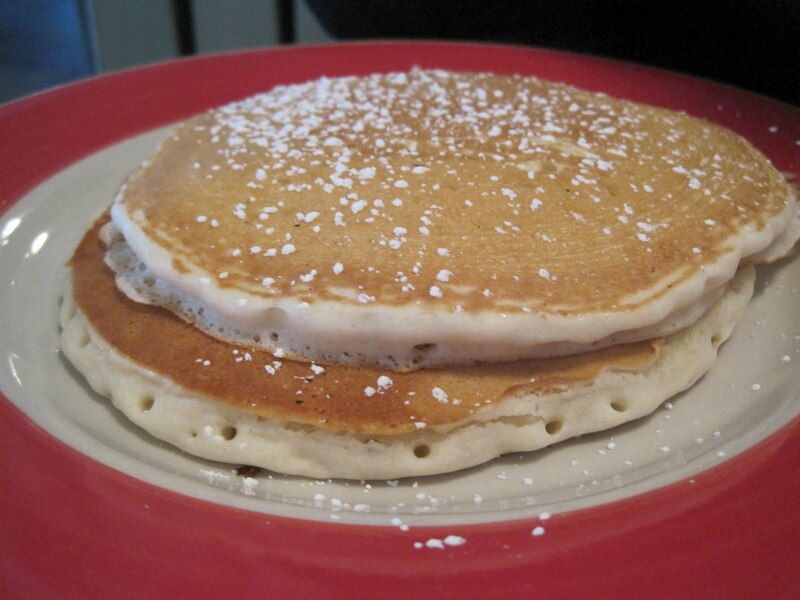 Not syrupy-sweet, just right. ABF ordered an unsweetened iced tea--very strong and pretty delicious. I'm a sucker for anything in a mason jar, FYI. options: the salsa is not really spicy, but flavorful with lots of chunks of onions. This meal was sort of a late lunch/early dinner, so I was extra-hungry and talked ABF into sharing a bowl of hot queso with me. 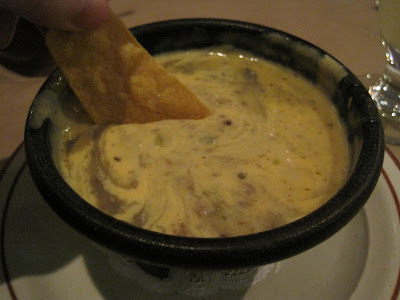 The cheese dip was a bit thin, , though, just a little too watery for me. 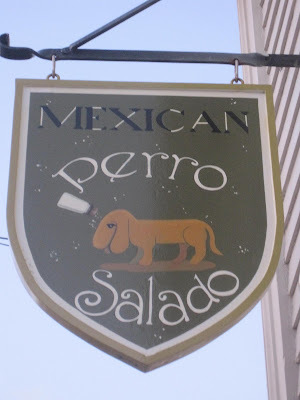 The chilies in it were a tasty touch, and when we mixed in some of the salsa it was even better, but honestly, I'd pass on this next time. 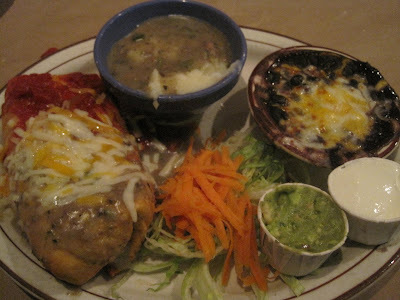 ABF ordered the Enchiladas Garcia, which came with one portobello mushroom enchilada and one chicken, both smothered (and I do mean smothered) in Monterey Jack cheese and green chili salsa. I think we both expected a tomatillo type salsa for this, but it was more of a New Mexico-type green chili salsa. Still good, just not exactly what we normally crave. For the sides, ABF ordered waffle fries (good) and a side salad, which was way better than I expected! A nice, light vinaigrette made your everyday shredded iceberg salad into something quick crave-able. 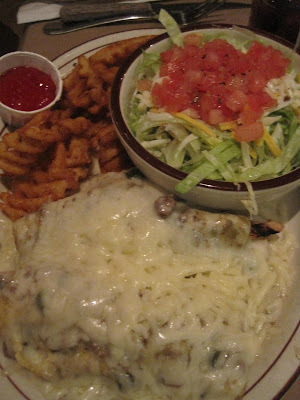 I went for the shredded chicken chimichanga--which was at LEAST twice the size I expected (I took home at least half of this for later, even after sharing several bites with ABF. It was good--tender chicken, delicious and spicy. My sides were the mashed potatoes with green chili gravy (so-so) and the black beans with a light layer of melted cheese (very good!) --this will make for great leftovers! The dessert menu at Pancho's consists of shot-glass sized mini-desserts--basically parfaits in all kinds of flavors. We chose red velvet, caramel apple pie, and key lime pie. 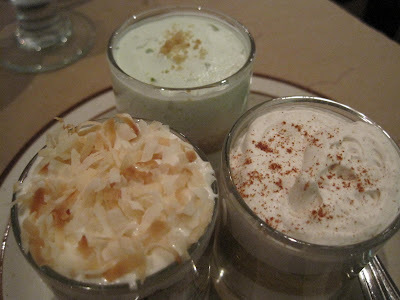 These were just right--a few bites of some different flavors..enough to sate a sweet tooth without overdoing it. Three for $7.50 is not a bad deal! 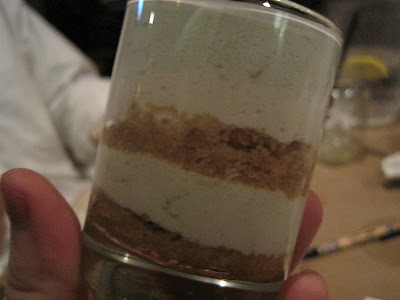 My favorite was the key lime pie--it had lime zest, a graham cracker crust layer, and tasted just like the real thing. ABF's favorite was the apple pie, even though it didn't have any crust-type ingredients. We both could live without the red velvet, which had an oddly tasty toasted coconut layer (even though I submit that red velvet shouldn't have coconut!). Next time around, I'm probably going to get two of the key lime! Three or four spoonfuls of deliciousness and you're done! Truly welcoming service, spot-on margaritas, delicious food, and pint-sized desserts--there are plenty of reasons for us to go back to Pancho's...and we will!